If you’ve noticed recently, Jet Airways has been going gung ho with their ‘Get More’ campaign, reiterating the fact that while you do end up paying a little more, you get a lot more. If you ask me, I think that’s quite true – gone are the days when there was a huge price difference between full service carriers and their low cost counterparts. 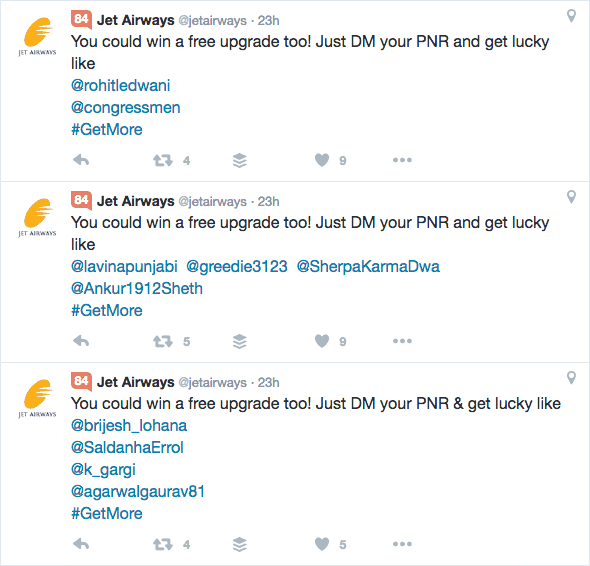 As a part of their ‘Get More’ initiative this month, Jet Airways has been offering free upgrades on Twitter. It appears to me that they are being quite liberal with the free upgrades – their Twitter timeline is filled with the airline sending out congratulatory messages to winners and the winners thanking the airline! Trying your luck at getting a free business class upgrade is quite simple. Book your tickets on the Jet Airways website or mobile app and send Jet Airways a direct message or DM with your PNR. If you are one among the lucky ones, they will announce your name on Twitter and send you a fresh ticket with business class seats. If you intend to fly with Jet Airways in the next few days, do try your hand at winning a free business class upgrade with them. Do note – this free upgrade is for domestic travel only, and there doesn’t seem to be a date restriction yet. Have any of you taken part in this GetMore campaign? Do let us know!